Yangon (AP) — Myanmar’s embattled leader, Aung San Suu Kyi, called for national unity Thursday and said she has created a committee that will oversee all international and local assistance in violence-struck Rakhine state. More than 500,000 Rohingya Muslims have fled from the state to neighboring Bangladesh since Aug. 25, when security forces responded to attacks by a militant Rohingya group with a broad crackdown on the long-persecuted Muslim minority. Many houses were burned down. 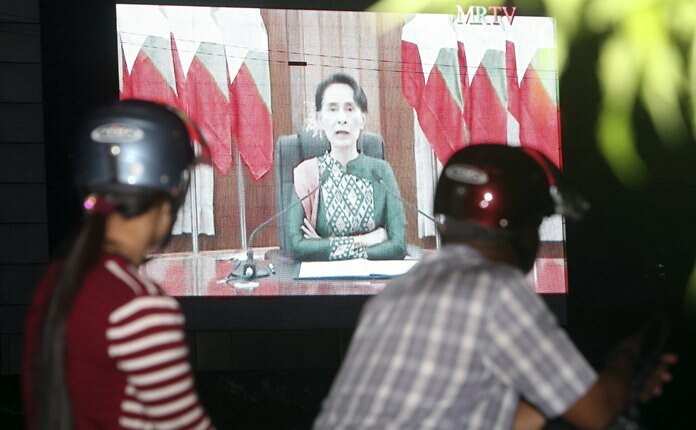 Suu Kyi acknowledged in a speech on state-run television that the country is facing widespread criticism over the refugee crisis and called for unity in tackling the problem. She said her government is holding talks with Bangladesh on the return of “those who are now in Bangladesh.” She gave no details, but officials have suggested they would need to provide residency documents, which few have. Myanmar’s Buddhist majority denies that Rohingya Muslims are a separate ethnic group and regards them as having migrated illegally from Bangladesh, although many families have lived in Myanmar for generations. Suu Kyi did not use the word “Rohingya” in her speech but referred to several other ethnic minorities by name. Suu Kyi, a Nobel Peace Prize laureate and former political prisoner, has been widely criticized outside Myanmar for not speaking out on behalf of the Rohingya. She said in her speech that those who return from Bangladesh would need to be resettled, without providing details, and that development must be brought to Rakhine, one of the country’s poorest areas, to achieve a durable peace. The government has tightly restricted access to Rakhine for international aid groups and journalists. Suu Kyi said her government has invited U.N. agencies, financial institutions such as the World Bank, and others to help develop Rakhine. Myanmar officials deny there has been ethnic cleansing. Myanmar’s ambassador to Japan, Thurain Thant Zin, told reporters in Tokyo on Thursday that his government was providing humanitarian aid to all affected by the violence and denied reports of human rights abuses by the military. At U.N. headquarters in New York, U.N. Secretary-General Antonio Guterres’ spokesman said he is sending Undersecretary-General for Political Affairs Jeffrey Feltman to Myanmar for several days starting Friday to meet government officials and others to address urgent issues the U.N. chief has raised regarding the Rohingyas. These issues include Guterres’ repeated calls for an end to military operations and violence in northern Rakhine state, unfettered humanitarian access, and the voluntary and “sustainable return” of refugees who fled to Bangladesh, U.N. deputy spokesman Farhan Haq said Thursday. Nikki Haley, U.S. ambassador to the United Nations, met Myanmar’s National Security Ambassador U Thaung Tun and raised the same issues. The U.N. Security Council, meanwhile, has invited former U.N. Secretary-General Kofi Annan, who headed a commission on Rakhine state, to an informal meeting Friday to discuss its findings and recommendations. The commission, which disbanded last month, focused on long-term solutions to improve people’s lives and addressed many of the root causes of the current crisis.